A basic solar water heating system needs only three components: a heat collector, a storage tank and connecting pipes. Systems made in the 1970s, when homesteaders began developing the technology, were not much more complicated than this, and many of them are still in operation. 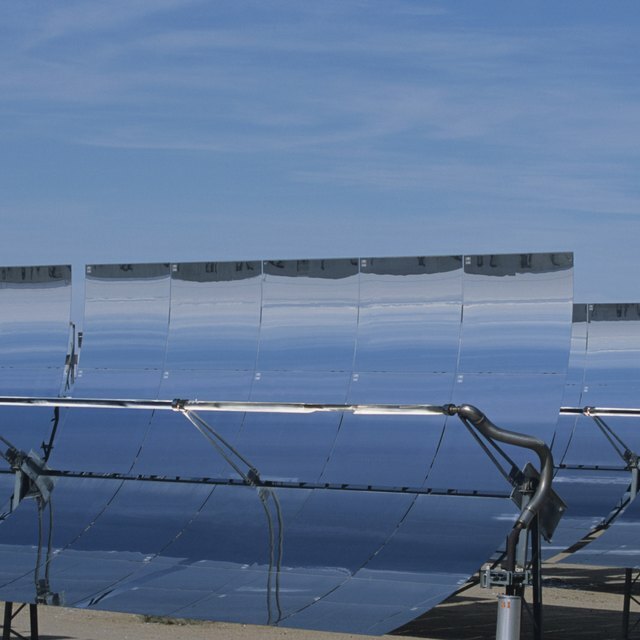 Solar hot water technology has evolved, however, to become an energy-saving option in climates with freezing temperatures and limited sunlight. The components of contemporary water heating systems are accordingly more varied and sophisticated. Many homesteaders used passive, open systems, in which the water that circulated between the collectors and the storage tank was the water they used for drinking and bathing. Passive systems aren't as efficient as those that use recirculating pumps, however, and the water in open systems is subject to freezing. Consequently, contemporary cold-weather systems are active, closed-loop ones. They circulate a fluid, such as water, glycol or methanol, between the collector and a heat exchange coil in the storage tank. When the fluid is water, they often include a mechanism for draining the water out of the collectors when the sun goes down. A solar hot water collector can be as simple as a black tank filled with water. Such batch collectors aren't the norm, however. Flat panels are more common, and there are two main types. The first type, which is easy to construct as a DIY project, is essentially a flat, insulated, black box filled with a coil of copper or plastic tubing and covered with glass. The other appears similar from the outside, but instead of tubing, it contains a series of copper pipes encased in evacuated glass tubes. The design allows efficient heating of the fluid inside the pipes while minimizing radiative heat loss. A conventional water heater makes a suitable storage tank for solar hot water, and it's possible to connect a home's existing water heater to an open heating loop. A tank for a closed-loop system, however, must have a pre-installed heat exchanger and ports for both the heating fluid and the water. It's usually easier to purchase a tank specifically manufactured for use in a closed-loop system than it is to convert a conventional tank. Systems that use a drain back approach, whereby water drains out of the coils at night, require a separate storage tank for that water. The temperature of the water in a solar water heater can get as hot as the water in a conventional water heater -- or even hotter -- so the tank needs a temperature and pressure relief valve. Moreover, because water expands when it heats up, most systems also need an expansion tank. Unless the system is one in which water circulates by convection, it needs a circulating pump. Moreover, a drain back system needs a temperature sensor and pump for the heating water. The pumps and sensors typically connect to an electronic control station. Deziel, Chris. "Solar Water Heater Component Parts." Sciencing, https://sciencing.com/solar-water-heater-component-parts-2709.html. 25 April 2017.